The collapse of the postcolonial Somali state in 1991 and the consequent outbreak of civil war drastically transformed the socio-political landscape in Somalia. Somalis reverted to the pre-colonial state of affairs and sought refuge in their clan attachments. Local authorities were contested by the warlords, traditional elders, Islamist organizations and modern civil society. Indeed, it was non-state actors that played incredible role in sustaining the livelihood of the stateless people. During this period, the role of women in socio-political affairs grew exponentially and Somalis’ national identity became reconfigured profoundly. This Volume 2 of a two-volume thematic history of Somalia focuses on four themes: the history of Somali civil society, the history of Somali traditional authorities, the history of the political ascendancy of Somali women and the historical evolution of Somali national identity. Volume 1 had explored the history of the people of Somali peninsula since ancient times, the advent of Islam and colonialism, the rise and fall of Somali nationalism and the various perspectives on the collapse of the Somali state. 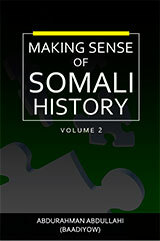 These eight chapters constitute comprehensive perspectives on Somali history designed as a history course for Somali university students as well as for general readers elsewhere. Dr. Abdurahman Baadiyow combines rare skills of being a high ranking military officer (1971-1986) with being an electronic engineer, Islamic scholar and socio-political activist. He obtained MA and PhD in Modern Islamic History from the Islamic Institute, McGill University, Canada. He is one of the founders of Mogadishu University and the chair of its Board of Trustees. He is a prominent civil society activist and was a presidential candidate in the 2012 election in Somalia. Dr. Baadiyow is a prolific writer and the author of three highly regarded books: The Islamic Movement in Somalia: A Study of the Islah Movement, 1950-2000 (2015), Recovering the Somali State: The Role of Islam, Islamism, and Transitional Justice (2017), and Making Sense of Somali History, Volume 1 (2017).